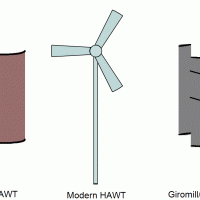 The three primary types of wind turbine, the Savonius VAWT, the Modern HAWT, and the Darrieus VAWT, are animated as if in operation. I first created this model in Geometry Expressions two years ago and after sharing it on Wikipedia it became quite popular and has been reused in many places. I decided to create an updated version, which features a cleaner appearance overall and adds some coloring to help distinguish between the blades of the Savonius model, as well as to make the HAWT better resemble real turbines. Please note that this version is not in the public domain, unlike the original, however it can be reused per the Creative Commons Attribution No-Commercial No-Derivs license, in accordance with Euclid’s Muse policy.